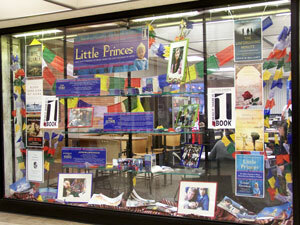 Little Princes by Conor Grennan is the 2012-13 One Book Villanova selection. Joanne Quinn, Falvey’s design specialist, created an exhibit highlighting Little Princes: One Man’s Promise to Bring Home the Lost Children of Nepal. The display also reflects the history of the One Book Villanova program, which began in the 2005-2006 academic year after a conversation between Joe Lucia, University librarian, and Terry Nance, PhD, professor of communication and assistant vice president for Multicultural Affairs. Grennan will be signing books in the Speakers’ Corner, first floor, Falvey, on Tuesday, Jan. 29 at 1:30 p.m. Bright blue informative posters, in the center, feature “The Story,” “The Author” and “Schedule of Events.” Photographs of Grennan, Grennan with Nepalese children and a map of Nepal complete the centerpiece. Framing the “Little Princes” materials and One Book Villanova posters are images documenting each of the eight previous One Book Villanova selections. Colorful Tibetan prayer flags form a backdrop.